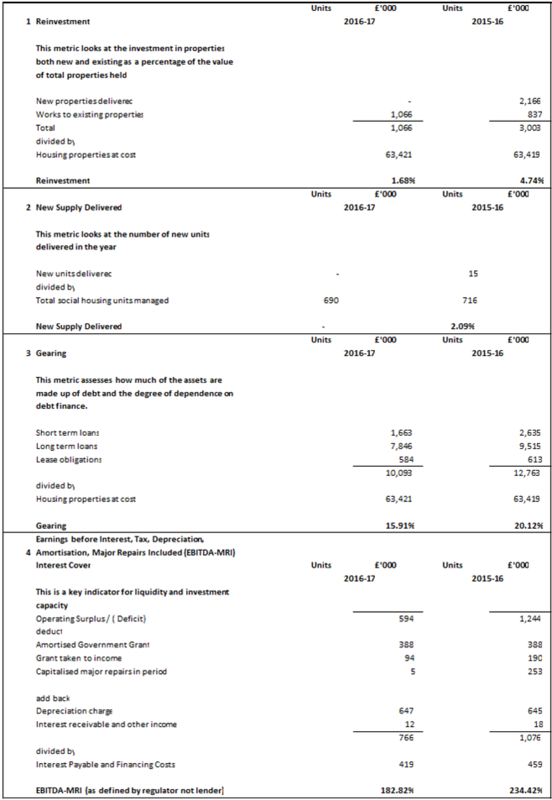 We carried out a detailed analysis of performance at the end of the 2015-16 financial year against the key elements of the value for money strategy, and reported against the strategy as below in our financial statements . Active Asset Management Strategy, replace, repurpose or dispose of low demand / high voids shared supported housing schemes Disposal of redundant hostel in Wimbledon – completed October 2015. Low demand hostel in Oxfordshire – remodelled for high care group. Void cover agreement with local authority. Now fully let. Completion of remodelled Residential care home in Farnham to deliver four self contained units of supported housing. Shared flat in Dorking – sale completed for £222,000. Development of new asset management strategy. Identify next quartile of poor performing stock. Quarterly VFM reports Quarterly drafts produced and agreed by the Board. Updated and revised VFM strategy approved at September 2015 Board meeting. Publication of performance report and trends. New strategy planned for 2016-17.
performance targets fed into 2016-17 plans. VFM impact assessment undertaken and included in minuted management team and board decisions. Quarterly performance reports issued to Board Service delivery costs identified and compared with local authority framework rates where possible. Individual management accounts produced per support service. Successful inclusion on frameworks and winning tenders indicates that prices are in line with authority expectations. Form a strategic cost reduction plan. Undertake project on alternative service delivery methods. Review overhead apportionment. Devise and implement exit strategies where services found to be unviable. Identify cost reduction targets Report on performance against the 15-16 budgets of cost per unit / hour targets on housing (10%) and support (1%). Management cost per unit of £1,200 exceeded target of £1,150. Direct support costs pre central attribution at 87%. Central overheads reduced to 9.3% of turnover from 12%. Monitor cost trends. Process continues into 2016-17 budget year. 2015-16 target cost reduction of 5% overall. Gather benchmarking data from selected peer group and compare costs / outcomes. Data from published sources Data obtained on support service costs and local authority expectations. Tendering price matrices used where available. Tendering results suggest we are at the market rate for the services provided. Hourly support average costs have been reduced by 2% in 2016-17. Benchmarking targets written into 2016-17 objectives. Further data on types of support service, housing and development. Further cost reduction exercises built into 2016-17 updated VFM strategy. Individual service cost reduction targets set as part of 16-17 budgeting process. Assess & evaluate social and environmental impact of business activities Support outcomes recorded. Social impact data being gathered. Comparative costs of long term residential care / hospitalisation vs cost of tenancy support. For example care fees approximately £1,000 per week per person vs 24/7 support costing under £600 for comparable numbers of customers. Research data via the DCLG benefits tool suggests that for each £1 invested in supported living saves £3.29 in health and other social benefit costs. Further assessment across all activities including energy efficiency, social inclusion. Raise profile of services provided, education and lobbying at government level. Quantify and publish savings achieved by our services. Review social benefits of services and investments Social impact data being gathered. Participation in community and social activity by supported customers, including attending concerts and participation in sport. Assess preventive aspects of housing support – e.g. enhanced quality of life vs cost of residential care / hospitalisation. Assess and publish social benefits of high standard housing. OJEU procurement process in respect of the new repairs contract. Awarded from April 2016, with expected annual savings of 10%. Scrutiny panel reports on repairs & voids. Comparison of data on repairs undertaken, energy ratings. Provide VFM training to colleagues and Customer panel members Standing agenda item at customer panel (CP) meetings. Research options available. Develop in house training resource. Encourage attendance at suitable seminars / courses. Involve customer panel in VFM consultation VFM issues discussed at CP meeting. Members invited to define their idea of VFM. Opinions sought on cost and service levels of repairs, rents and service charges. Energy contract management so far saving approximately £15,000 per year. Ongoing outcomes report to board and committees. Production & monitoring of associated action plan. Include on Customer Service Committee agendas Customer scrutiny roadmap developed and project on voids undertaken. Customer panel met with repairs contractor. Panel input into rent setting policy. Tenant/ customer surveys. CS meetings to consider feedback on VFM from customer panel.Data analysis and feedback action plans. Reduce central overheads Review of business staffing requirements undertaken with two posts disestablished and external communications outsourced. Net saving of approximately £40k p.a. Data gathering from activities above. Build savings into 2016-17 budget Included in 2017 budget setting process. Target of £50,000 p.a. savings. Working groups devised local business plans. Employment costs held to current levels. Central cost budget held to 9% of turnover. The 2015-16 strategy remained in place for the financial year 2016-17 and some targets were revised or added. More effective deployment of cash resources in the reduction of loan balances to yield interest savings of £44k in 2016-17. In the last months of the 2016-17 financial year a consultation document on a revised approach to Value for Money was issued by the housing regulator. This document proposes building on the current value for money standard in order to continue to drive value for money in the sector, to ensure that a strategic approach to delivering value for money is embedded in the business, to encourage investment in new homes and new housing supply, and to enhance to consistency, comparability and transparency. In order to achieve these objectives, and to improve on the consistency and comparability of reporting, the revised standard proposes to shift the emphasis from a narrative basis of VFM reporting to a series of objective metrics based on standard definitions driven by the audited financial statements as reported to the regulator through the annual FVA (regulatory submission of financial statements) submission. The tables on the following reflect the performance of Ability against the proposed metrics for the financial year 2016-17, with the metrics based on the 2015-16 financial statements as a comparator. Looking forward, the setting of demanding margin improvement targets for 2017/18 along with a stronger balance sheet position by year-end, mean that VFM improvement remains a core element of Ability’s delivery strategy, with these financial measures supporting qualitative improvements within tightly controlled cost boundaries. also delivering efficiencies and increased financial performance over the next two financial years. The full benefit of this investment will realised by the end of financial year 2019/2020. Ability are investing strongly in the quality of it’s offering, in the physical environment of the accommodation particularly through Landlord Health and Safety expenditure, and in both the location based and floating care and support services provided. Investment in people continues to be challenging given the pricing pressures on services commissioned from Ability, but this continued investment provides enhanced VFM through improved staff retention and a larger talent pool for recruitment. Recent highly effective procurement of on-line training services and continuation of the policy of ensuring that starting salaries exceed the National Living Wage ensure access to that talent pool. We have procured locally based maintenance and repairs service to maintain our housing stock. This will provide a better more personalised service to tenants and provide a more efficient service, better designed to maintain properties over a dispersed geography. 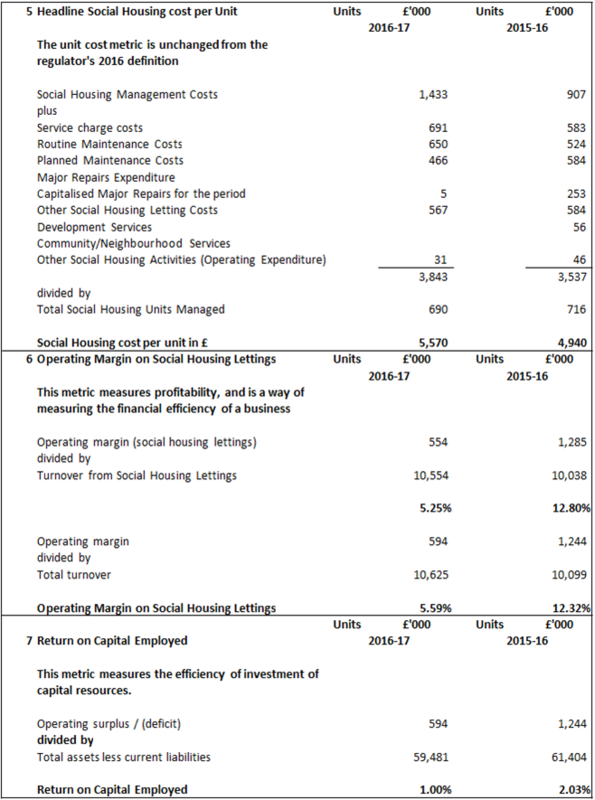 The final version of the revised VFM standard was issued by the regulator in early 2018, and this will inform a review and update of the Ability Housing Association Value for Money, reflecting the revised business plan and the investment made in service delivery both at the front-line and in the management team level.